The Sayan mountains are a system of deeply eroded ridges with an average altitude of 1000-2000 m and its highest summit, the Munku-Sardyk, reaches 3492 m. The Sayans occupy an area of about 455 000 km2 and are split into two segments: the Western Sayan with ridges extending from the south-west to the north-east, and the Eastern Sayan with ridges with a south-eastern strike (Figure 14.6). The main watershed of the Western Sayan is formed by the Abakan Ridge and the Alash plateau, whose heights exceed 3100 m at the junction with the Altay. Eastwards, the mountains become lower and the easternmost ridges are 2300-2500 high. The northern part of the Western Sayan is formed by low and medium flat-topped ridges separated by mature river valleys. Similar to the Altay, typical of the southern part are elevated plateaux from which isolated peaks emerge, reaching a height of 2500-2800 m. In the south, the Western Sayan is bordered by a system of depressions of the Central Tuva basin; in the north it is limited by the Minusinsk depression. Characteristic of the Eastern Sayan is a well-expressed altitudinal zonality in relief. The uppermost zone, represented by alpine forms, coincides with the axial Great Sayan (Pogranichny), Kryzhin, and Udinsky Ridges. Their average heights vary between 2000 and 3100 m, increasing eastwards and individual peaks exceed 3400 m. The ridges located northwards — the Mansky, Shindinsky, Kansky, and Idarsky belogorye — have a typical intermediate (1600-2400 m) montane landscape with extensive flat watersheds dissected by river valleys reaching 700 m in depth. The low mountains and the foothills, surrounding the Eastern Sayan from the west, north, and east, have mature eroded landscapes with well-developed river valleys of about 400 m depth and multiple alluvial terraces. In the south, the mountains dip to the Oka basin, a 2500-2600 m high plateau with degraded mountains and canyon-like river valleys. Similar to the Altay, the Sayans were repeatedly glaciated in the Quaternary. The establishment of a detailed stratigraphic scheme and reconstruction of the Pleistocene history in the mountains remain difficult even using modern dating methods and the number of glaciations, their status, and maxima are still debated especially with respect to the earlier events. The earliest studies by Yakovlev, Grane, and Obruchev distinguished two glacials. In the 1920s — 1930s, Kuzmin, Lvov, Molchanov, and Tyumentsev applied the Alpine scheme to the Quaternary history of the Sayans. Later, Efimtsev (1961b), Dubinkin (1961), Lamakin (1961), and Devyatkin (1965) suggested that the intense climatic cooling of the early Pleistocene did not lead to the development of glaciation and that the late Pleistocene glaciation was limited to alpine regions and its extent was similar to that of the middle Pleistocene. Others (Dumitrashko and Olyunin, 1959; Shorygina, 1961; Shukina, 1960; Aleksandrova, 1961; Lundersgauzen and Rakovets, 1961; Rakovets and Schmidt, 1963) supported the occurrence of the early Pleistocene glaciation while Grosswald (1965), Bogachkin (1967), Borisov and Minina (1980) maintained that the widespread occurrence of the early Pleistocene deposits across the Altay-Sayan region points to a vast ice cover. In their view, the alpine-valley glaciers of the middle Pleistocene age were much more extensive than those of the late Pleistocene. The scheme discussed in this chapter presents the most widely accepted views. The alluvial sediments, dated reliably to the Eoplei-stocene, are found in the Tannu-Ola mountains, Todzhinsk depression, and the Academician Obruchev and Sangilen Ridges. The deposits are 10-35 m thick and contain pollen of the forest-steppe species similar to those found in the Bekensk suite in the Mountainous Altay and dated to 910 ± 100,1082 ± 128,1200 ±100, and about 1500 Ka BP (Stratigrafiya SSSR, 1984). The beginning of the Pleistocene was marked by the accumulation of alluvium containing iron-rich boulders and pebbles in river terraces uplifted to 40,120, and 200 m. Traces of the two early Pleistocene glacials have been uncovered in the central part of the Eastern Sayan. Petrographic composition of the till, which has a high proportion of tuff, shows that during the first (termed the Shivit) glacial sources and centres of boulder dispersion were the Shivit and Derbi-Taiga volcanoes in eastern Tuva. The orientation and shape of the boulders suggest that volcanic eruptions occurred beneath the ice. The age of the till is determined from its position between the 600-700 m thick layer of the Eopleistocene sediments and a layer of middle Pleistocene sediments. The analogous Katun till in the Altay has been reliably dated by thermoluminescence to 476 ± 51 Ka BP (Stratigrafiya SSSR, 1984). Grosswald (1965), the main proponent of large-scale glaciations in the Sayans and elsewhere, suggested that the Shivit glacial was of the Icelandic type, whereby extensive ice caps developed across the region without building a single ice dome. The till, attributed to the second (the Sorug) early Pleistocene glacial, is found in the Todzhinsk depression. The sediments, which are about 7-8 m thick, contain pollen of Pinus sylvestris, Betula, Picea, and Abies. These are underlain by the interstadial alluvial deposits composed mainly of pebbles and sand. The alluvium contains pollen of more heat-demanding plants such as Pinus sibirica and some broad-leaved deciduous species (Stratigrafiya SSSR, 1984). Deposits, representative of the interglacial separating the early Pleistocene and the middle Pleistocene glaciations, have been uncovered in the 90-120 m high river terraces in the Eastern Sayan, the Todzhinsk depression, and the Academician Obruchev and Sangilen Ridges. These contain alluvial sediments and material of volcanic origin. The middle Pleistocene deposits are represented by two stratigraphically discrete tills testifying to two stages of the glacial. In the Western Sayan, the till attributed to the earlier (the Alash) glacial is mainly of erratic boulder composition (Shorygina, 1961). In the Eastern Sayan, where the earliest middle Pleistocine glacial stage is termed the Ulugkhem, the 15-20 thick till containing boulders and pebbles occurs on both banks of the Great Yenisey and the Little Yenisey, extending from the modern river channels for a distance of 250 km. The extent of the deposits can be traced by distinctive ridges and hummocky forms. Sandy deposits, originated in proglacial lakes, occur widely in the river valleys and are believed to be of the same age of 260-190 Ka BP (Stratigrafiya SSSR, 1984), correlating with the Samara glacial of Western Siberia (Table 2.1). The second stage of the middle Pleistocene glaciation, termed the Tolaitin in the Western Sayan and the Kakhem in the Eastern Sayan, is represented by till and alluvial deposits found in the in-land river deltas and river terraces. The position of marginal formations, attributed to the Ulugkhem stage, allowed Grosswald (1965), Borisov and Milyaeva (1973), and Borisov and Minina (1973) to suggest that the ice extended over much larger areas than during the Kakhem stage. Deposits, attributed to the interstadial separating the two stages of the middle Pleistocene glaciation, are represented by lacustrine and alluvial fan sandy and clay deposits, found in the Western Sayan, containing pollen of forest-steppe plants (Matveeva, 1960; Stratigrafiya SSSR, 1984). Evidence for the late Pleistocene glaciations is well preserved across the region. Although earlier Eflmtsev (1961b), Grosswald (1965) and Olyunin (1965) argued that the Sayans were glaciated once during the late Pleistocene, a two-stage model has been adopted (Devyatkin, 1965; Okishev, 1982; Stratigrafiya SSSR, 1984). The first late Pleistocene glaciation, termed the Karakhol in the Western Sayan and the Azass in the Eastern Sayan, was far greater in extent than the following one and reached its maximum between 58 and 32 Ka BP, thus correlating with the Zyryanka glacial in Siberia. Moraines, deposited by the Karakhol glaciation, contain large blocks of transported material and attain a thickness of 100 m (Stratigraflya SSSR, 1984). The Azass till, containing pebbles, boulders, and large blocks of rock, covers extensive areas in the basins of the Kazyr and Kizir rivers. The Azass glaciers were of various types and had particularly large dimensions in the eastern part of the southern slope of the Yergik — Targok — Taiga Ridge, on the western macroslope of the Eastern Sayan, in the central and eastern Todzhinsk depression and the eastern part of the Academician Obruchev Ridge. The ice, which built up in the Yergik-Targok-Taiga, was linked to the valley glaciers of the Kazyr-Kizir basin and to the reticulated ice of the eastern and north-eastern macroslopes of the Great Sayan. In total, the ice covered over 30 000 km2 making this particular region the most heavily glaciated one in the Sayans. Apart from large dimensions, its distinguishing feature was the development of almost all types of glaciers including piedmont, plateau, and mountain-valley, as well as large ice reservoirs formed by confluent ice (Grosswald, 1965; Borisov andMilyaeva, 1973; Borisov and Minina, 1973). A variety of morphologically distinctive features was left by the second late Pleistocene glacial, termed the Chulchin in the Western Sayan and the Bashkhem in the Eastern Sayan. The ice reached its maximum extent about 13-14 Ka BP, which correlates with the Sartan glaciation in Siberia. The Chulchin moraines, attaining 10-30 m in height, are well preserved in the Central and Kantegir-Borus Ridges and at the junction of the Shapshal, Central, and Saldzhur Ridges, where fresh glacial cirques are ubiquitous. Glacially derived erratic material is well preserved on the Alash plateau which has numerous glacial troughs containing lakes. Stratigraphic and lithological evidence for the Bashkhem glaciation is extensive in the north-west of the Eastern Sayan. In this region, the ice covered about 15 000 km2 and complex branching glaciers, occupying modern valleys of the Kazyr and Kizir rivers, reached 200 km in length, descending westwards to a height of 450 m (Grosswald, 1965). In the central and eastern Eastern Sayan, the glaciated area attained about 10 000 km2 (Olyunin, 1965). Although this glaciation is often described as reticulated, glacial conditions were especially diverse in this region in response to the high spatial variability of precipitation. The largest centre of ice dispersion was the Great Sayan Ridge, from which large valley glaciers spread westwards and eastwards. In the south, the ice flowing from the Great Sayan Ridge and the Munku-Sardyk massif formed plateau and piedmont glaciers. Further east, large valley glaciers developed in the Kitoy and Tunkin mountains with a piedmont glacier developing at their northern foot. North of the Kitoy mountains, large glaciers developed on the northern and north-eastern slopes of the Peredovoy chain (formed by the Shili, Yerminsky, and other ridges) while the inner parts of the mountains remained largely free of ice. There is uncertainty about the position of the snow line during the last glacial due to the use of different methods of estimation and also the continuing uplift of the area. Maksimov (1973) estimated the snow line depression in the Munku-Sardyk massif during the glacial maximum as 980 m, while other studies show that the snow line was positioned 500-600 m below the modern one (Grosswald, 1965; Eflmtsev, 196la, b; Olyunin, 1965). The use of cirque floor altitude is widely used to identify the position of the ancient snow line. However, the use of this technique is limited to the slopes of northern, eastern, and north-eastern aspects where more than 80 per cent of all the cirques occur between 1600 and 2800 m. The times of steady snow line coincided with the periods of glacial stability and, therefore, terminal moraines may be a more useful source of information. While uncertainties exist about the depression of the snow line, it is agreed that it attained its lowest position in the Peredovoy chain, rising westward and north-westward and reaching its maximum height in the central part of the Belsky Ridge. The transition between the glacial maximum and the beginning of the Holocene was marked by minor stadials and interstadials, and glacier fluctuations continued in the Holocene. The nature, number, and regional correlation of glacier oscillations are debated. Thus, Ivanovsky (1976, 1981) points out that the number and position of marginal formations differ between individual ridges and even between individual valleys in the same ridge, showing that glacier fluctuations were not concurrent across the Sayans. By contrast, Shnitnikov (1957) and Maksimov (1972) believe that glacier fluctuations were a manifestation of a 1850-year climatic cycle and occur simultaneously across the region. Having analysed the position of cirques in the Eastern Sayan, Gudilin et al. (1952) distinguish three or four stages of ice retreat. Maksimov (1965a, b, 1972, 1973) argues that ice retreat occurred in eight phases, the evidence for which is preserved in the most elevated regions where the most recent fluctuations occurred while lower and middle mountains had been deglaciated. More recent studies of terminal moraines and the positions of glacial lakes, conducted in the south-eastern part of the Eastern Sayan and in the adjacent Khamar-Daban mountains, have shown that in most regions there were four to six stages of ice retreat (Budaev and Nemchinov, 1986; Larin, 1989a, 1993; Nemchinov et al, 1998). Marked differences appear in the position and structure of marginal formations at different stages of deglaciation. While moraines of the earlier stages are positioned at similar altitudes and are well-preserved across the region, pointing to the contemporaneous ice retreat, the location of moraines of the more recent stages reveals the increasing role of local factors (Larin, 1993). 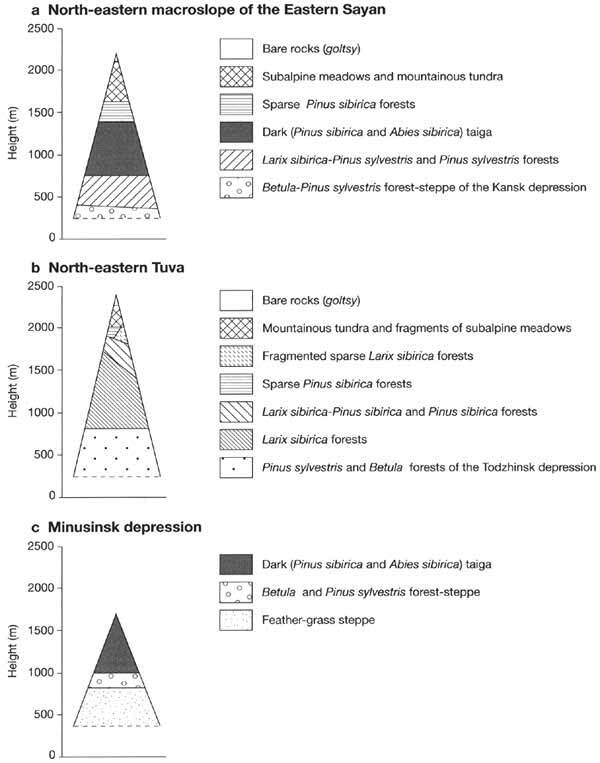 The knowledge of nonglacial Holocene environments in the Sayans is still fragmented and most data refer to the foothills and the Minusinsk, Tuva, and Tunkin depressions (Orlova, 1980; Belova, 1985; Savina, 1986; Larin, 1989a; Mikhailov et al., 1992). Evidence for climatic change is provided by pollen analysis and variations in the altitudinal position of the tree line. The largest upward migration of the tree line occurred during the Atlantic when small-leaved deciduous forests and steppe communities spread in the foothills and lower mountains. In the middle mountains, occupied by coniferous forests, the climate was milder and more humid than at present and moisture-loving Abies sibirica was a dominating species (Larin and Chernova, 1992). A change towards drier and colder environments took place in the Subboreal. During this period, steppe plants became rare while shrublands of Betula rotundifolia expanded and Pinus sibirica became the main tree species. The decline of Abies sibirica continued through the Subatlantic in response to increasing aridity. Climatic fluctuations continued during historic times. Young moraines, attributed to a glacial advance between 1540 and 1640, point to a deterioration of climate in the Sayans (Ivanovsky and Panychev, 1978; Mikhailov, 1987). Similar to the Altay, short-term glacial advances occurred repeatedly between the middle of the 18th and the beginning of the 20th century (Maksimov, 1965a, b; Larin, 1989b). Further support for colder climates has been provided by analysis of tree rings, which has revealed a slower growth of larch in the Munku-Sardyk massif and the Okinsk plateau between the end of the 17th century and the 1730s (with a minimum in 1722) and between the 1760s and the 1930s (with a minimum during the 1830s-1840s) in response to general climatic cooling enhanced locally by advancing glaciers. Precipitation varied too. Thus, the regression of lakes in the Mondinsk depression points to dry conditions during the first half of the 16th century and during the last 200-225 years (Larin, 1988). The Sayans have a strongly continental climate with a short but warm summer and severe winter forced by the Siberian anticyclone. In the foothills and intermontane depressions, the mean June and July temperatures are about 16-18°C (Figure 14.6) and on individual days air temperature can exceed 30°C. In winter, the temperature declines landwards from about -16°C in the northern Western Sayan to -22°C to -29°C in the south-east. The intermontane depressions have especially cold winter climates. Thus, in the Tuva depression, the mean January temperature is about -34°C and the absolute minimum of -58°C has been registered in the Usinsk depression. Under the conditions of strong radiative cooling, persistent temperature inversions are common with typical vertical temperature gradients of 3-4°C per 100 m. The spatial distribution of precipitation is extremely complex and strong contrasts between mountains and intermontane depressions and slopes of different orientation are typical. In general, the northern slopes of the Western Sayan and the western slopes of the Eastern Sayan benefit most from moisture brought by the westerly flow. The foothills, medium (1000-2000 m), and high mountains receive 400-500, 700-800, and 1000-1800 mm a-1, respectively (Mikhailov, 1961). The eastern and south-eastern regions of the Eastern Sayan (the Okinsk, Nukhu-Daban, and especially the Alash plateaux), as well as the intermontane depressions located in the rain shadow (particularly, the Usinsk and Mondinsk) are exceedingly dry, with respective annual totals of 200-550 and 230-300 mm a-1. Summer rainfall predominates across the region. The Siberian anticyclone, centred just south of the Tuva depression, creates an extreme precipitation deficiency in winter, especially in the Eastern Sayan where winter totals account for as little as 1-5 per cent of the annual norm. The duration of snow cover varies between 150 and 260 days as a function of altitude. Snow depth changes from 40-50 cm in the north to 20-30 cm in the southern low mountains, reaching about 1.6 m in the middle of the northern macroslope of the Western Sayan and 1.5-3 m in the high mountains in the Eastern Sayan. East-facing slopes usually have a thinner snow cover. Avalanches are among the major natural hazards in the Sayans, being particularly common on the elevated and dissected peneplains (Alekseev, 1973; Kravtsova et al., 1979; Revyakin, 1981). A characteristic feature of the Sayan avalanches is that they usually do not follow any specific snow-slide tracks because snow does not accumulate in specific catchments. Instead, large masses of snow slide from entire slopes (Volodicheva and Pashkov, 1987). The frequency of avalanches varies according to the variability in winter precipitation. The dry climate of the Sayans does not favour the development of glaciation and this is much less than in the Altay. Glaciers are confined to high mountains exposed to the westerly flow. The altitude of glacial termini rises south-eastwards from 1900 m in the north (the Kyzyr and Kan basins) through 2250 m in the central Eastern Sayan to 2850 in the south and 3050 m in the south-east (the Munku-Sardyk). Similarly, the snow line rises from 2100-2300 m in the Kizir-Kazyr Ridge through to 2450-2700 in the Great Sayan range to 2940 in the Munku-Sardyk mountains. Although it is western and northern slopes that receive maximum precipitation, snow is redistributed by wind and glaciers develop mainly on the northern and sheltered northeastern slopes where summer melting is delayed. There are 159 glaciers in the Sayans, including 52 with a combined area of 2.3 km2 in the Western Sayan and 107 covering 31.8 km2 in the Eastern Sayan (Arefiev and Mukhametov, 1996). Despite the small size of glaciers, different types are represented. Cirque glaciers dominate, accounting for about 60 per cent of the total number and area. Permafrost occupies about 50 per cent of the total area of the Western Sayan and almost the whole of the Eastern Sayan except for its westernmost part. In the Western Sayan, continuous and discontinuous permafrost develops in central regions while island permafrost occurs along the southern and northern peripheries. In the Eastern Sayan, the continuity and depth of permafrost increase landwards. In high mountains, on elevated peneplains and watersheds, permafrost is continuous, while in the middle mountains it is discontinuous and in the foothills it occurs as islands (Rozenberg, 1989; Rozenberg and Bardina, 1989). Observations in the Kitoy Ridge have shown that on slopes between 2140 and 2280 m, the depth of permafrost ranges between 150 m and 200 m and reaches 400 m and 430 m on the southern and northern upper slopes at 2350 m. In the river valleys at 2000 m, permafrost is about 150 m deep (Solovieva, 1976). Similar observations and estimates have been obtained for other regions. In general, permafrost reaches its maximum depth on watersheds and upper slopes where there is a reduced geothermal flux, while its depth is minimal in river values and along fault zones where the geothermal flux is higher. However, this relationship is complicated by aspect, persistence of winter temperature inversions, geology, and ground water conditions (Rozenberg and Bardina, 1989). In particular, a widespread development of taliks (areas of thawed permafrost) is typical of those areas where thermal springs, associated either with faults or with karst, emerge. Under such conditions, permafrost can thaw through its depth as, for example, in the marginal regions of the Okinsk plateau, where springs with a temperature of 29-34°C occur, and in the river Bokson valley, where discharges of the karst-related springs reach 300 1 s-1. Due to the insulating effect of water, shallow taliks form under lakes and rivers and permafrost temperatures are higher in the vicinity of water bodies. By contrast, permafrost temperatures are minimal under peatlands developing on northern slopes. These effects are explained above. As elsewhere in cold climates, physical weathering is one of the most important geomorphological agents in the Sayans. Vast amounts of cryogenic eluvium are produced by frost erosion. This is particularly intense on southern slopes where temperature cycles around freezing point are more frequent. About 2.5 kg m-2a-l of debris form on southern slopes while 2.3, 1.5, and 0.6 kg m-2a-1 form on eastern, western, and northern slopes (Laperdin and Trzhtsinsky, 1977). Typical of the elevated plains, lake and river terraces and upper parts of gentle slopes is frost sorting. This forms rock outcrops of various shapes, while frost wedging creates characteristic polygonal microrelief. Cracks, separating polygons, are usually about 15 cm wide and 0.5 m deep and are often filled with ice. However, in many areas these can be larger-scale features buried under the soil and filled with relict ice. Thus, in the basins of the rivers Uda, Biryusa, and Gutara the 0.1-0.8 m wide ice wedges occur at a depth of 1.5-2.5 m, extending to a depth of 7-17 m (Osadchy, 1982). Frost heaving is another important process and frost mounds, which usually reach 2-3 m in diameter and 7-10 m in height, are widespread near the tree line, in the alpine tundra zone and in swampy river terraces and small depressions. The development of thermokarst is often associated with ice wedges and frost mounds. Solifluction is widely developed on high watersheds and on gentle slopes (under 20°), particularly where the ground has been transformed by cryogenic weathering and where there are water-saturated thawing soils. Solifluction produces characteristic forms such as microterraces, tongue-shaped lobes, and spreads at slope bases. Streams and small rivers transport this material and often bring about the settling and sliding of the mass and the formation of mudflows. Typical of the non-glaciated high mountains are block fields and block streams (termed kurum) formed by frost weathering of exposed rocks. In the Eastern Sayan, kurums occupy about 7-8 per cent of this altitudinal belt. The thickness of deposits increases downslope and usually varies between 1.5 m and 5 m. On 40-45° slopes, kurums move at a rate of 140 cm a-1 in the centre of the field and on the 30° and 10° slopes at rates of 90 and 30 cm a-1, respectively. At the edge, the velocity is 5 -6 times lower (Rozenberg and Bardina, 1989; Osadchy, 1984). Textbook forms of rock glaciers occur in glacial cirques and troughs in the Great Sayan, Tunkin, and Munku-Sardyk, mainly on the northern slopes. Rock glaciers, developed in cirques, have concave tongues which become flat at one edge and form cliffs, reaching a height of 30 m, at the other. In the case of troughs, debris accumulates and replaces the retreated glaciers. Rock glaciers in the Munku-Sardyk belong to this type. They have a length of 1-1.5 km and their cliffs exceed 100 m. Rock glaciers are composed of coarse debris supplied by frost weathering, and tills and hollows are often filled by ice (Maksimov, 1965a). Icings occur widely in the Sayan mountains, except in their westernmost part, covering about 1 per cent of their total area (Alekseev, 1989). They develop on the frozen surfaces of streams and rivers when seepage water freezes. They form extensive ice fields in valleys and depressions, being of great concern for construction works and maintenance. The average thickness of icings is about 1 m below an altitude of 1000 m and about 2 m (though sometimes reaching 11 m) between 1000 m and 2300 m. The area between 1200 m and 1600 m is particularly prone to their formation and in the basins of the Gutara, Uda, and Irkut, ice fields exceed 800 thousand m2 and contain up to 1760 thousand m3 of water. Icings usually develop between October and April and thaw between April and August, providing additional supply of water to streams and rivers. Seasonal icings dominate, but perennial ones also occur. The rivers of the Sayan mountains belong to the Angara-Yenisey basin. The Yenisey itself rises in the Western Sayan and cuts across the entire massif. River courses conform with the general structure of the mountains and typical is a combination of lengthwise and lateral valleys. Rapid uplift in the Neogene-Quaternary forced rivers to entrench their valleys, while selective erosion and numerous dislocations resulted in the formation of steep cornices and waterfalls. Most of the rivers originate in the high mountains, either in the nival zone or in the mires on watersheds. In their upper courses, valleys are often typical glacial troughs; in the medium mountains, the depth of valleys varies and those coincident with tectonic faults are usually very deep and narrow. The Sayan lakes are mostly small and shallow. They develop in cirques and glacial troughs or as a result of moraine damming. There is a clear altitudinal zonality reflecting stages of glacial retreat. Thus, in the south-eastern part of the Eastern Sayan, most lakes occur between 1800 m and 2570 m and there are 5-8 levels where lakes are most abundant (Larin, 1993). Despite its continental location, drainage conditions are favourable and even in the Eastern Sayan, which has a dry climate, the density of the river network varies between 0.5 and 1.0 km per km2 (Laperdin and Trzhtsinsky, 1977). Specific runoff increases with altitude from 6-10 1 s-1km-2 in the steppe zone to 1-15 1 s-1km-2 in the alpine tundra. The highest values, reaching 30-40 1 -1km-2, occur on the north-western macroslope of the Western Sayan and in the upper course of the Great Yenisey, which flows in a valley extending from the north-west to the south-east. The westerly flow is channelled into the valley and precipitation forms due to orographic uplift. Most rivers have either the Altay regime or the East Siberian regime (e.g., the Yenisey) distinguished by high water levels between spring (when the maximum is reached) and autumn, and extremely low discharges in winter. The summer monsoon reaches the eastern part of the Eastern Sayan and its rivers (e.g., the Oka and the Uda) have the Far East regime with a high discharge in summer. 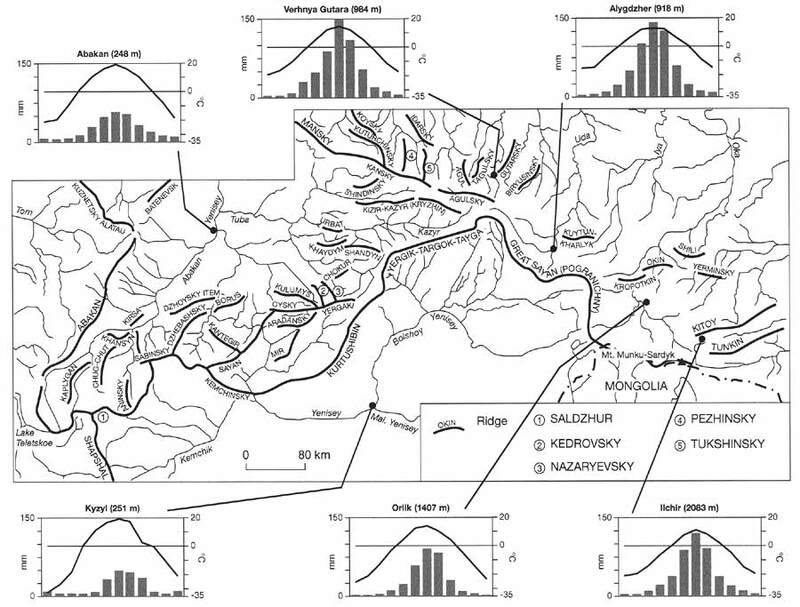 River regimes are discussed above and hydrographs are shown in Figure 5.6. Vertical zonality is well expressed in the distribution of soils and vegetation in the Sayans. Although topographic and climatic variability create differing vertical sequences, all are dominated by taiga vegetation. In the Western Sayan, there is a considerable difference between the altitudinal sequences of the northern and southern macroslopes. In the north as well as in the west of the Eastern Sayan (including the southern slope of the Mansky Ridge and the Kizir-Kazyr watershed), where the climate is relatively mild and humid, the vertical sequence is similar to that of the north-eastern Altay (Figures 14.5 and 14.7). In the forest-steppe belt, which develops in the foothills, woodlands are composed of Betula pendula, B. pubescens, Finns sylvestris, and Lam sibirica and intermingle with herbaceous and steppified meadows. Chestnut soils predominate. In contrast to the lowland steppes of Western Siberia, soils contain a large amount of rocks and outcrops of bedrock' occur frequently. There is also a difference in species composition of steppes: eastern and mountain-steppe species (e.g., Leontopodium sibiricum) occur, while many species common on the West Siberian lowland (e.g., Filipendula hexapetala) are absent. In regions with drier climates (e.g., in northern Khakassia, the lower course of the Great Abakan), feather-grass steppe communities develop in the foothills. The most prominent feature of the northern Western-western Eastern Sayans sequence is the large extent of the dark taiga belt. This is composed mainly of Pinus sibirica and Abies sibirica with an admixture of Larix sibirica in the upper regions. Picea obovata is another important tree species, especially in river valleys. However, there are many different varieties of dark coniferous forests. The lower part of the forest belt has been substantially modified by human activity. In many areas taiga has been replaced by secondary Betula-Populus tremula forests. Patches of pristine taiga survive only locally. Humic eluvial soils develop under the dark taiga. The relatively high amount of precipitation, received by the western sector of the massif, enhances slope drainage. The lateral movement of soil solutions accelerates the leaching of the upper-slope soils and enriches soils down the slope. This limits podzolization. The high mountainous zone is represented by floristically rich subalpine and alpine meadows and mountainous tundra communities. 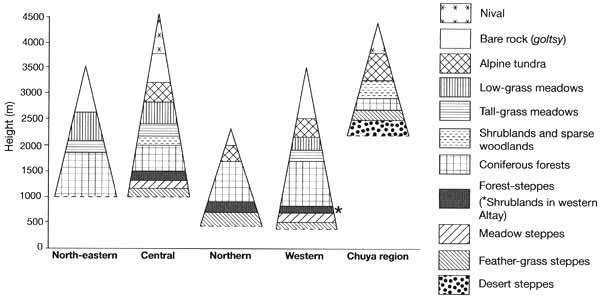 The very dry Minusinsk and Chulym-Yeniseisk depressions have a specific vertical sequence different from most of the northern Western Sayan (Figure 14.7). It is distinguished by the development of feather-grass steppe on chestnut soils, passing into forest-steppe. Both belts have a large extent which may only be compared with the central Altay. The southern macroslope of the Western Sayan, which faces the Khemchinsk and Tuva depressions, receives more insolation and is much drier. This sequence begins with the steppe (which is intensively cultivated at present) developing on chernozem and in drier regions on southern chernozem and chestnut soils. The steppe zone is succeeded by a narrow belt of Betula-Larix sibirica forest-steppe. In the region of the Alashar plateau, the steppe zone attains an altitude of 1200-1900 m. The forest belt is represented mainly by Larix sibirica forests with well-developed undergrowth and the herbaceous cover enriched by steppe species. The dark taiga is confined to the upper part of the zone, being higher than on the northern macroslope. The highly variable topography of the Eastern Sayan results in a complicated vertical zonality which changes from west to east. Gorbachev (1978) and Ogureeva (1982, 1999a) distinguish three sectors: western, northeastern, and south-eastern. In the north-eastern part, which has a more continental climate than the western sector, forests composed of Pinus sylvestris and Larix sibirica with a rich herbaceous cover occupy the lower mountains. Forests composed either of Pinus sibirica or of Abies sibirica have the most prominent position extending across the middle mountains. On the border between the forest-steppe and forest zones, natural vegetation has been modified significantly. Much of the forest has been cut and transformed into grazing and hay fields. Secondary birch forests occur widely and many steppe species are found in open spaces. In the 1950s and the 1960s, the Pinus sibirica forests in the Eastern Sayan were extensively damaged by the pine silkworm and large areas of forest were completely destroyed. The upper part of the mountains is occupied by subalpine meadows, where thickets of shrubs (Salix spp., Betula rotundifolia, Rhododendron parvifolium, and Alnus fruticosa) are widespread, and alpine meadows passing into mountainous tundra (Malyshev, 1965). In the south-eastern part (the Great Sayan Ridge, Okinsk plateau and in the side ridges of the Yergik-Targok-Taiga), where the climate is dry and annual temperatures are negative, the altitudinal vegetation sequence begins with steppes which extend to 700-900 m and locally 1300 m (Ogureeva, 1982). The steppe flora has many Mongolian species and locally acquires a typical Mongolian composition. In contrast to the other regions, azonal steppe vegetation on dark chestnut and chernozem soils develops on terraces, especially on south-facing slopes. Larix sibirica forests dominate up to an altitude of 1200-1600 m and locally Pinus sylvestris groves develop. In the herbaceous cover, steppe plants occur in addition to the usual forest species. Only in the upper part of the zone, is precipitation sufficient to support Pinus sibirica, which forms the timber line. In contrast to the dry south-facing slopes, forests on the northern slopes are often swamped, especially at higher altitudes. Humic eluvial soils dominate in the forest zone while podzolic soils are typical of the northern slopes and gley soils develop in the areas of permafrost occurrence. The development of subalpine and alpine meadows is very limited; they are fragmented and do not form a continuous belt. The upper mountains are occupied by heath and lichen tundra communities. The fauna of the Sayan mountains includes over 70 mammal and about 250 bird species, most of which are typical of the taiga biome.